1 No one knows how the Jew's harp got its name. It's not Jewish. It's really not a harp! This odd instrument is small, about four inches long. It is made of a band of metal shaped like an onion. 2 The metal runs in two strips from the place where the onion's stem would be. A thinner strip of metal comes from the bottom of the onion. It stretches up between the "stem" strips. This thin metal bends and is kind of bouncy. It is called a tongue. 3 How do you play a Jew's harp? First, you hold your lips in a big smile. 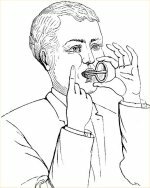 Then you place the harp against your teeth. You might look like you were holding an onion sideways in your lips!